Response: In the U.S., approximately 1 in 30 baby boomers are chronically infected with hepatitis C virus. Half of all cases of liver cancer are caused by hepatitis C and liver cancer is one of only three cancer types that are actually increasing in incidence in the US. Because of this, in 2012 the CDC issued a recommendation for universal screening for hepatitis C virus for everyone born between 1945 and 1965 (baby boomers). We wanted to look at the time period after that to see if the rates of screening in that population increased. From 2013-2015 screening among baby boomers only increased by 0.9% (from 11.8% to 12.7%) which indicates we still have a long way to go before we meet our goal of universal screening. 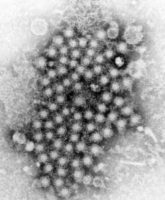 Response: HCV screening used to be risk-based (that is, people would be screened if they used injection drugs, were incarcerated, had an accidental needle stick on the job, etc.) but we are now discovering a significant portion of the HCV infected population was born between 1945 and 1965 but do not currently report any of these risk behaviors. That is why it’s so important to screen everyone in this age group. Importantly, this increased and expanded emphasis on screening for HCV is now in an era where we have highly effective, well tolerated treatments for HCV infection. Our study is among the first to look at the average risk population for baby boomers as well as other age groups to identify factors associated with screening across the age spectrum. But most importantly, if you were born between 1945 and 1965, ask your healthcare provider about getting screened for HCV. Response: Now that we know that rates are so low and they haven’t meaningfully increased, the next step will be to identify areas for intervention. We’ll need to figure out what the biggest barriers are so that we can address them. Our team is partnering with health care systems in the state of Florida to examine screening rates. We are also considering more in-depth studies using a combination of interviews and surveys with key stakeholders at the patient, provider, and systems barriers to HCV screenings. Disclosures: One of the coauthors, Dr. Giuliano, and her institution have received funds from Merck as a member of Merck Scientific Advisory Boards. An additional author on the study, David Nelson, MD, has received grant support from Abbvie, Gilead, and Merck. All other authors declare no conflicts of interest. This entry was posted in AACR, Author Interviews, Cancer Research, Hepatitis - Liver Disease and tagged baby boomers, hepatitis, Hepatitis C, liver cancer by Marie Benz MD FAAD. Bookmark the permalink.